What’s the Best Glue for Polymer Clay? Sooner or later when working with polymer clay you’ll need to glue things together. You might have already baked something when you want to add more design elements. Or you might need to add a bail to a pendant. Or perhaps you want to glue earring posts onto some neat little polymer cabochons. Or crystals to a design. What next? What’s the best glue for polymer clay? I’ve been asking experienced clayers this question for a long time and I’ve received hundreds of responses. I’ve checked out glue websites. I’ve read glue package labels. I wish I could say that I’ve tested all these options. In some ways, I have, through sheer experience (and failure) with many of the products and strategies listed. But to do a side-by-side comparison of dozens of glues on several brands of polymer clay and then evaluate their durability over years would be quite the logistical nightmare. So in this case I just compiled what I’ve learned from all of you and will summarize here. I hope you find it helpful. To bond uncured polymer clay to another piece, it’s best to use liquid clay or other bakeable glue such as Kato Poly Paste or Sculpey Bake and Bond. To bond two pieces of cured polymer clay that will not be baked again, use a flexible superglue such as Loctite Gel Control, Zap-a-Gap, or Gorilla Glue GEL Superglue. 2-part epoxy is another good glue for use with polymer clay. It can become brittle with age and pop off. To bond metal to polymer clay, it’s best to bake the metal into the clay. Glue will not be reliable for this bond over time. E6000 is highly recommended by others, but it often does not properly set on polymer clay or becomes brittle with age. I think there are better alternatives. To bond polymer clay to wood, paper, or fabric, use a strong white or PVA glue such as Weldbond. There is no perfect glue for all uses. Polymer clay is plastic and can be flexible, making a durable bond challenging. I would love to be able say, “Buy this glue, it’s perfect for all your polymer clay projects!” But I can’t. No one glue or gluing strategy is good for all situations. Every glue has its fans. And every glue has just as many people complaining that it failed. I’ll talk about specific situations later, but the most common scenario that people want help with is the problem of gluing cured polymer clay to metal, such as when you glue a bail to a pendant. This is a very difficult bond to make. Some glues don’t cure fully when used on polymer clay, or they degrade the clay and make it sticky. So a glue that works fantastic on another material doesn’t necessarily work great on polymer clay. Also, polymer clay is flexible and metal isn’t. So while a rigid glue like super glue works great on metal, it’s notorious for popping right off of polymer the minute the piece is subjected to any stress. The best solution for gluing polymer clay to metal is to use a physical bond, not an adhesive bond. In other words, you can’t rely on a glue. For the most secure attachment, you need to find a way to embed the metal into the the clay itself, so the clay is physically holding onto the metal. (More on this further down.) 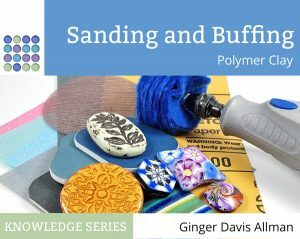 But first, I’ll talk about the glues and other products you can use to bond polymer clay. As I said above, using an adhesive to bond baked polymer clay to metal can be quite frustrating. Many people have found that the bond will fail within a few years and the metal will pop right off. Even when a glue works wonderfully for other applications, you’ll find it quite challenging to get a good long-term bond of baked polymer clay to metal or glass. No matter what glue you use, it’s always best to prepare the surface. Always use alcohol or acetone to remove any surface oils from the baked polymer clay and the metal piece. Make sure the clay is lightly textured, so the glue has something to hold onto. And know that gluing anything to baked polymer that has surface treatments (sealer, mica powder, paints) just will not work. Any glue will bond to the surface treatment, not the baked polymer clay, leading to a very weak bond. Super Glue is brand name (originally) but has now come to mean a class of glue made from cyanoacrylate. You might see this called “CA” in some groups and forums. CA is a fantastic chemical that can, believe it or not, act as a glue or even a sealer and surface for polymer clay. My pen from Toni Ransfield has a CA finish on it, in fact. CA is crystal clear, cures almost instantly (in seconds), and is notorious for gluing your fingers together. The most common brands of CA, the ones in those little tubes that end up being single-use because the cap glues itself on, are great for bonding ceramic, metal, and glass. But it’s a very brittle glue and doesn’t work well for anything that will flex, such as plastic or rubber. So when used to glue a metal bail to a polymer clay pendant, the bond will eventually fail given enough time and wear. There are nicer grades of CA glue. There are some that have a flexible gel component to them, so they’re not quite as runny when applied, and tend to hold up better with polymer clay. A product known as Loctite Gel had many, many positive votes from my readers. Another excellent superglue gel is Gorilla Glue Superglue Gel. Another favorite glue with polymer clay artists is one called Zap-a-Gap, and from what I can tell it’s also a gel-forumulated CA glue. In general, cyanoacrylate glue cannot be baked because the bond will deteriorate with heat. But Lisa Pavelka’s Poly Bonder is a cyanoacrylate glue that IS formulated to have a strong bond even when baked up to 300°F (150°C). When someone on a polymer clay on group or forum asks about the best glue for polymer clay, the most commonly recommended product is E6000. It is a clear gel-like glue that you squeeze out of a tube. It’s a superior glue for jewelry-making, in general, and does a fine job of gluing stone cabochons into a metal bezel, for instance. So most crafters have it on hand and are already familiar with it. But when used on polymer clay, it doesn’t seem to perform nearly as well. I have found that it takes a long time to cure, if it does at all, and the bond can easily be pulled apart a month later. That’s my experience. But other people report that the glue cures nicely but then has the same trouble as the CA glues…it is brittle and the bond will pop apart at a later date. If you’re having good luck with E6000, then great. But don’t feel badly if you don’t. E6000 does have a strong solvent component and is pretty noxious to breathe. While it doesn’t degrade polymer clay, it can give you a headache so make sure you use good ventilation with this one. Know that you cannot bake E6000, the bond will degrade with heat. Also, the shelf life, once opened, of a tube of E6000 seems to be pretty short. If it’s rubbery and gummy coming out of the tube, toss it and buy a new tube. You might have used Urethane glues such as Gorilla Glue. In general they expand and foam while curing, making them messy and frustrating to use. But there is a really nice urethane glue called Liquid Fusion. It comes in a bottle, is about the same consistency of honey, has a mild fresh odor, is non-toxic, and dries clear and glossy in about 2-4 hours. Liquid Fusion doesn’t get foamy like Gorilla Glue. In fact, you can use Liquid Fusion as a resin substitute to make a thick clear coat on polymer clay. This dries hard, clear, and durable. I think it holds great promise and would like to explore it further. Let me know in comments if you’ve used this glue. Epoxies are a general class of adhesives and coatings where you combine equal parts of two resins to create an activated product that hardens within seconds to hours, depending on the formulation. You probably have tubes of epoxy glue in your garage or workshop as it’s an excellent all-around glue for bonding all sorts of things. The simplest epoxy glues are those little tubes, that look like super glue, that you mix together with a toothpick and apply to your project. Epoxy glues are often packaged in a double syringe form that dispenses equal amounts of each resin component. Epoxy glues actually work very well with polymer clay. They bond well and hold tight. But I DO have bond failures with this glue. Perhaps some of the higher quality epoxy glues will work better, such as this plastic-specific epoxy, another one called Devcon, and a highly recommended glue called Epoxy 330. By the way, you might wonder if Epoxy glue is related to Epoxy resin such as Envirotex Lite. Yes, it is. It’s the very same thing. The difference is the “open time” or the time that the material is workable before the bond starts to set. Epoxy glues can be used as a clear coating, but because their open time is short, there’s not a lot of time for bubbles to rise to the surface and for the surface to self-level as with a coating epoxy resin. PVA is short for poly-vinyl acetate, and PVA glue is just white glue. Like Elmer’s Glue-All. Now Elmer’s is a pretty basic glue and not particularly strong or water-resistant (which jewelry needs to be). But there are stronger PVA glues. My favorite is one called Weldbond. I first used it for gluing glass mosaic tiles onto a glass mirror. It works great for that, and it even holds up in the weather. But it’s also a good glue for polymer clay, IF you can get it to stick to the clay without peeling. I haven’t done a lot of work with this, but I have had a couple of people say that Weldbond works great with polymer clay. Your mileage may vary, of course. The beauty of Weldbond is that it’s non-toxic. This is a material that needs to be explored further in the future. PVA glue is also a nice glue to seal paper boxes and forms if you’re going to cover them with polymer clay. Doing this makes the paper non-porous and gives a surface the clay will bond to easily. It’s also nice when gluing polymer clay to glass. By the way, you can bake PVA glue at polymer clay curing temperatures. Another well-known brand of PVA glue in the polymer clay community is Sobo Glue. Aleene’s Tacky Glue is another well-known PVA glue. Tip: When applying raw polymer clay to glass, such as covering a wine glass or votive, you don’t need any glue. The clay will stick tightly to the glass. After baking, it should stay fairly well if left undisturbed, but can be popped off if you lift an edge. You can glue the clay back onto the glass, if necessary, with PVA glue. But you do NOT need to use PVA glue to adhere raw clay to glass. This Holo Heart features crystals embedded into the polymer clay. Learn to make the Holo Effect with the Holo Effect Tutorial. When you want to include crystals, gems, or stones in your polymer clay creations, just push them directly into the raw clay, then bake. After baking, you can lift the edge of the stone or gem and it will pop right out. Use your glue of choice and glue it back in, then it will stay permanently. Because the “seat” for the gem is perfectly matching the shape of the gem, the bond will be good with almost any glue. If the foil backing of the gem peels off when you do that, just glue a new gem back into the hole. Perhaps you’ve underbaked a project and a piece has broken off and you need to re-attach and bond two sections of cured polymer clay. Or maybe you want to attach some raw clay to an already baked project. The best solution is always to use a baked bond. There are several materials that are essentially made of the “goop” or base of polymer clay, that can be used to “glue” two pieces together, creating a very strong and stable bond. You do need to rebake the project to cure the “glue”. Since the bond doesn’t happen until the project is baked, you will likely need to support the weight of the two pieces, holding them together in some way, until you can bake the project. What are these materials? You likely have them already. There are four brands of liquid polymer clay: Translucent Liquid Sculpey, Kato Liquid Polyclay, Fimo Liquid, and PVClay Gel. All are a thin, slippery-feeling, honey-textured liquid that are essentially the same thing as polymer clay but without the fillers, binders, and pigments. All of these brands bake nearly clear and work well to bond raw clay together, to bond raw clay to baked clay, and can be used to “glue” baked clay together. Because liquid clay can be a runny, though, you’ll get a better results with the next options if you’re needing to bond baked clay to baked clay. Liquid polymer clay can be used for many more applications, though. Gluing is just one many, many uses. Sculpey Bake and Bond is quite similar to Translucent Liquid Sculpey but is a bit thicker and more opaque. It’s designed to be exclusively used as a bonding agent and doesn’t work as well in other liquid clay applications. Kato Poly Paste is a thick paste made from the same basic materials as the liquid clays, but in the form of a thick paste. It will not run, does not dry out, and will cure by baking. It cures without color, though not completely clear. The big advantage to Poly Paste is that it stays exactly where you put it. The Genesis line of heat set paints and mediums are made of heat-cured (thermosetting) materials very similar to and completely compatible with polymer clay. This line of products is a favorite of polymer and doll artists worldwide. The Genesis Thick Medium seems to be the same product as Genesis Thick Medium – Extender (as far as I can tell, anyway). Thinner than the Kato Poly Paste, and having more of a creamy consistency sort of like mayonnaise, this medium comes highly recommended as being excellent to glue cured clay to cured clay, such as when you attach two halves of a hollow piece together. But remember, like all Genesis products, it must be baked to cure. By the way, Genesis also works well to bond metal to clay. As I discussed above, when you glue metal to polymer clay, the bond is likely to be weak. So the best solution is to create a physical bond where the polymer clay itself holds the piece securely. If you want to use a metal bail on a pendant, don’t rely on glue to hold the bail on. Use the polymer clay to surround or cover part of the bail so that it is physically holding the bail. This way it’s far less likely to come off. This works for barrettes, pin backs, earring posts, glue-on bails, and making polymer settings for glass or stone gems. If you plan ahead, you can make it part of the design. When you add a little tab of clay over a glue-on bail it is a perfect place to put a signature stamp, the year, or a decorative cane slice. I even have used this method for securely attaching button backs to polymer clay buttons. This was an awesome comprehensive post!! I’ve needed this info for so many projects and over the years have probably experimented using all these glues but never ‘kept notes’ – so thank you so much for this! side note – i used an epoxy on some baked polymer pieces to make a full necklace about 2 years ago and I noticed that it STILL smells like fresh-out-of-the-package clay when I take it out to wear it – not stinky bad but still makes me ??? Thank you. I could have gone on and on, but the post was getting long as it is. I’m not sure what is going on with your necklace. Smells are so funny, it’s just so hard to know. I am new to all this: What is the clear stuff that is used in clay peaches in a jar? That’s most likely resin. Some people use Fimo deco liquid, but I believe resin dries the clearest for projects like that. JB Weld actually does not hold up that good with heat. A simple dishwasher cycle will break the bond fairly easy. On automotive use it’s more in the lower temp ranges. It’s also more putty than anything else. Ed, it’s not really a putty, it’s awfully runny. About like Elmer’s. I have used it many times (because it’s all that was available at my grandpa’s house!) And you know your glues so you know lots of better options. It’s certainly better than el cheapo super glue, though. It’s held up just fine for me, Ed. Perhaps the heating element in dishwashers gets a lot hotter than the temperature at which we cure clay? And for longer? Yep! In your Hinger Bracelet tutorial. That’s why I acquired in it the first place and fell in love with it. Argh. I meant your Hinged Bracelet tutorial, obviously. The formula’s apparently changed a lot since your grandad’s day, since you can mold it now. That’s what I do, around bails. And I can sand off any rough spots after it hardens. Honestly; I wouldn’t have bothered you with a message about a sub-par adhesive, Ginge. It’s the only thing I trust to hold bails to my clay. Everything else has come unstuck. And Bettina above said she just ordered some more because she really likes it; I gather she doesn’t find it runny, otherwise she’d use something else. Sounds like I need to give it another try. I like that it’s not runny anymore. A putty epoxy that stays put…that sounds great. Even if it is yugly gray. See…I knew I wasn’t the only one! Your experiences are so similar to mine. I used Poly Bonder in a recent workshop with Lisa Pavelka and it’s a lot nicer glue than I thought it was. It just works. So you might want to reconsider if you have a lot of instant glueing to do. Sorry about the troubles with the comment form…my developer (my sweet husband) was fixing something today and it sounds like bad timing. It’s all working now. BTW, I really enjoyed your recent article about nibbling. I even bought the book. I have a feeling I’ll be giving out copies of it, too. Thanks! You are absolutely right. Even the double tube epoxy glues have a shelf life (18 months). I was very disappointed when I tried to use it on something and it wouldn’t set, only to find out that it wouldn’t keep forever. Has anyone tried the new UV set glues yet? How do they work? I didn’t realize the had a such a short shelf life, but it makes sense. I think the UV glues sound wonderful, personally, but I haven’t tried them. There’s like 20 different J B Weld formulas…which did you use? Hey, Ginger, Another great review!! I am going to try some of the different brands that you mentioned that I haven’t tried before. I also have a question: Have you done any experimenting with polymer clay on wood? I love to cover wood boxes with clay. Since clay won’t stick to wood, I coat the box with a white glue, like Sobo. After that dries the clay sheets will stick nicely to the box. But I’ve found that after a year or two the clay cracks. Is this because of the glue or something else? If it’s the glue can you recommend what I should use? I don’t think it’s due to the glue, I’d say it’s due to the expansion of the wood with humidity. I would make sure you use a clay that’s flexible, like Premo. And not one that’s brittle like Sculpey III. And make sure you fully bake the piece a looong time so the clay is as strong as it can be. That’s my guess. OK. I use mostly Premo but also Sculpey III. I will try baking for a longer time and see if that helps. It may also help if you bake the box _before_ you put the glue or clay on, to drive out the water in the wood. Hi Alessio, Poly Bonder is supposed to be heat resistant to 300°F (150°C), but you’re right it’s a CA. I think PVA would work to hold your crystals in the clay. But have you tried just plain old Fimo Liquid? I’ve heard that the Genesis Medium will work for this, too, so you might want to look into that. Thanks for another great article Ginger. I use a thin layer of resin on the back of the pendant so it seals the bail in place. I’ve never had a bail that came detached with this method. I’ve also embedded the bail in the polymer clay but strengthened the bond by winding thin wire around the bail and then also embedding a coiled end of the same thin wire in between the front and back pieces of the pendant. Once the polymer clay cures the bail cannot be removed and the embedded wire strengthens the whole piece. I like this method the best and have a pendant made this way that is almost 10 years old and that is still in wonderful shape. What a great idea. Resin is some pretty tough stuff. And that’s a great suggestion to embed wire into the clay to reinforce the bail further. Thank you for sharing. Thank you for a great review of glues! I have a large collection of glues as I am always searching for that perfect glue! I noticed I have that Fusion glue and will have to try it. Super glue had failed me and more recently E6000. PVA has never worked for me. After a friend highly recommended gorilla glue, I tried it but it just wouldn’t hold. I will definitely check out welbond. Thank you! Because liquid clay is made of the same stuff as polymer clay, there is no chemical degradation or breakdown. It should last as long as your clay creation does. Hot glue peels right off polymer clay, sadly. Part of the solution will depend on the engineering and how much surface area there is between the two. If we’re talking a large, tall, figurine standing on a wooden base, I would add a screw from the bottom, going up into the polymer. If we’re talking a flat figurine applied to a wooden board then I think a good gooping of liquid clay would work nicely. I would honestly try using the Liquid Fusion. It seems to have the kind of hold that would work. Wonderful and helpful article. I would like to add a great glue called The Ultimate by Crafter’s Pick. I love this glue because it is non-toxic. It is a white glue that dries clear with some flexibility. It is great for gluing gemstone cabs to metal or glass. I have also used it to glue Premo cabs to metal and to glass and leather with excellent results. This is an amazing glue for jewelry makers who want to avoid toxic fumes and chemicals. Hi do you think it will work with gluing a gemstone cab to baked clay? Sounds like it would be a good choice. Hey, Ginger: your Liquid Fusion link is a 404. Just FYI. All fixed. Thank you my dear. You are super woman of PMC! I can attest Bake and Bond doesn’t work the same as Liquid Sculpey – learned that one the hard way 🙂 This was a super read and I’m passing it along to the girls. Thanks! I’ve not compared them side by side in any tests, but they do act differently. I will have to put that on my list of things to try. Hi, I bought some Golden Medium Gel because I saw it in a tutorial (and now I can’t find the tutorial, LOL) and I was wondering if I could use it as a glue, to bond raw to raw clay or baked to raw clay or even a glaze for my polymer clay jewelry items. Hi Ifama, in general, a gem medium is used as a paint additive to give a thicker, more gel-like consistency to acrylic paint. Although you can use many art materials in new ways, I don’t have any experience with using gel medium as a glue. I would think it would not have enough strength for bonding baked or raw clay. There are better materials for that, such as Sculpey Bake and Bond, or any liquid clay. As a glaze, I suspect it would be a bit too thick and would leave brush strokes, and again there are better options such as Varathane or another Golden product called Polymer Varnish with UVLS. However, there’s nothing to lose by experimentation. You might find that it works perfectly well. Thank you for this great information. I am still a bit confused about how I should proceed with my new project and would love clarification. I want to attach both a bail and a fender washer (to attract a magnetic) to the back of a polymer cab. After reading this great review and the comments after I am understanding that I should start my testing with either a two part epoxy or a liquid clay. This that correct? Or did I miss something important? I would always prefer to use a physical bond. So I would try to embed the bail into the clay in some way. And then attach the fender washer to the back with a bakeable bond. Top of my list would be Genesis Thick Medium, but second would be Bake and Bond or possibly liquid clay. I would not rely on glue. E6000 is often suggested as a good glue in this situation, but I find that it either gets old and cracks off after a few years or never sets up and stays gummy. That Genesis medium is fantastic stuff if you can get it. It’s a tiny jar, but you use it forever. Is this what you were suggesting? Yes indeed, that’s the one! Cool thanks again!!! I am so excited to try this with your Rustic Bead Tut – which is great y the way. Polymer clay wedding topper (2 dinosaurs) broken – one of the necks snapped off. Afraid to mess it up, which glue to use? Already hardened and some stuff attached like a lace veil that won’t take heat well. Advice? Many thanks. I would drill a hole in both sides of the neck so that you can insert a wire in there to reinforce the break. Then use a high-quality cyanoacrylate glue such as Loctite Gel or perhaps Lisa Pavelka’s Poly Bonder to make the bond. The wire will be making the connection and holding the pieces together, the glue will just serve to close the gap. Good luck! I’ve had sooo much trouble with glues and polymer clay. I’ve found the only reliable bond to be with Liquid Sculpey or a physical bond. But, I’ve run into a problem making dust plugs for phones. The plugs are plastic and cannot go into the oven so I have to rely on glue. I’ve tried E6000 and two part epoxy (my favorite glues) but I have so much trouble getting the plugs to stay attached and survive the wear of being plugged in and out. Any advice? Thanks! Some people say that JB Weld is really strong on polymer clay. But I don’t think any glue is going to work because of cure inhibition (due to plasticizers in the clay), the physical pulling of the plug, and the small area of contact. Is there a way you can drill into the plug and embed a wire in it that goes into the clay? There is a product called Sugru that is moldable and air dries to a flexible rubber. I use it to cover the phone charger cord ends, so they will not fray. It has a hundred different uses. You can buy it on Grommet.com. I have even used it to plug cracks and holes in huge water troughs. It is a totally different product than polymer clay. Please check it out. I have no affiliation with them, I’m just a huge fan. Bookmarking this super helpful page for future reference! Can I ask what you think might be best to use for gluing polymer clay to grosgrain ribbon? I think that Gorilla Glue or another urethane glue such as Liquid Fusion would work very well. Hot glue will peel right off, even though it will seem to hold well at first. I absolutely love Liquid Fusion. When I started making wands, I had a terrible time adhering crystals to wood. This stuff works perfectly. I’m glad you’ve had success working with it and polymer clay! I have a glass bead with a broken loop that I want to use clay + a glue to fix. I think the two of these should work fine. I saw an E6000 jewelry glue that specifically named polymer clay as one of the materials it works on(where the regular version does not). Has anyone tried it? I’ve not seen that. If you run across it again, I’d love to know the name and I’ll look into it. Thanks! Yes, E6000 can have trouble curing for some reason. It always stays soft for me. Yes, resin is quite hard, but it does tend to work pretty well. Cool idea for a bracelet! Ginger, have you had any experience in gluing polymer clay to fabric? If so, which adhesive have you tried, and how were the results? Hi, I’m not Ginger but I do have some experience with fabric and polymer. Loctite Gel is a great glue to use. It dries quickly and stays on pretty well. If you wanted something that gave you a little more work time, there is Aileens tacky glue. These are the two most commonly found in stores and both hold on pretty well. The Loctite does have a problem if you use too much of it in one spot where it will make the fabric turn paler and hard. So using small amounts is best. The tacky glue takes a while to fully harden, but if you want a longer work time to adjust or change it then that’s not necessarily a bad thing. Good luck! I would use either a strong waterproof PVA glue (such as Weldbond) or a urethane glue like Liquid Fusion and the original type of Gorilla Glue. Another good option for smaller areas would be a gel superglue such as Loctite Gel or Gorilla Glue Gel. I agree that products in one country won’t be the same in another. Fimo will stick to glass on its own, so you don’t need to glue it if you’re surrounding the glass with the clay. But to make a permanent bond after baking, you can use a PVA glue (it’s usually white, used in schools). Or try a urethane glue. Those are typically clear or amber, don’t have any strong smell, and need a bit of water in the air to cure. No, that won’t work for polymer clay. Tylose powder is essentially cellulose and sugar. It’s a natural, edible glue that works great for fondant, but it doesn’t have any holding power for plastic polymer clay. Very informative article! Thank you for sharing. I have been reading through but require some confirmation if I have teased out the right products that would be applicable to my project. I make baked clay cabochons (Sculpey, Premo,FIMO brands) and glue on metal earring posts (stainless steel) to the back. I have tried super glue and E6000. They work sometimes and other times, do not. I need a product that I can trust!! **Along with a physical bond? I am thinking now of gluing the metal post on and then covering it with more clay and re-baking it. I would so appreciate your thoughts!! Always appreciated! This is great and it helped me so much! Thank You! I was wondering what is the best type of glue to use to attach polymer clay to plastic earring posts? I would use Loctite Gel. I would like to bond polymer clay to a glazed ceramic tile (the type intended for a shower wall). Would it be okay to bake on the tile with a bake-able glue or is it better to use a loctite gel type glue to bond post baking the polymer clay? Or would you suggest something else entirely? Getting a flexible material, such as polymer clay (which is actually vinyl) to adhere to a glossy inflexible surface is one of the hardest bonds to make. I would actually suggest a 2-part epoxy glue such as JBWeld. “Glaze” or varnish won’t make polymer clay stronger. Any glue that works for polymer clay will work. I recommend a gel superglue, such as Loctite Gel or Gorilla Glue Super Glue Gel. Great and informative article, I’ve been making butterflies on wire stems from sculpey and glossy card. I had been using hot glue to stick the body of the butterfly (sculpey) to the wings (card) and it had been going okay until now when I discovered a few of them had come loose. Can you let me know if I’m understanding you correctly; my best option now would be to get that Liquid Fusion glue? Or would I be better to adhere using liquid clay and then bake? Or any other suggestions you have would be much appreciated!! I think that a urethane glue would work nicely (such as Liquid Fusion or Gorilla Glue), and also a gel superglue such as Loctite Gel Control. Hot glue isn’t really a glue as much as a molten plastic. It doesn’t have much adhesive qualities, especially on non-porous materials (it works great on fabric because of the rough surface). Pretty much any glue will be an improvement for you. First off I loved your article, very informative! I’m a beginner in poly clay work, and so far I’ve made every mistake in the book, but it’s been a really fun learning process. I was just wondering if you had any advice for attaching fur to polymer clay? I want to attach clay to a wooden box…do I glue it on after I bake it and what kind of glue do I use or do I bake it on the box, do I still use something between the clay and the box…..then i want to put a finish on it so what do i use….. I haven’t done a lot of this, so maybe others will have more experienced input to share. You can glue baked clay to a wooden box, and I’d use a strong PVA (white) glue such as Weldbond or Sobo. You can also apply the raw clay to the box and bake it. Glue is used for this in two ways. One, apply PVA glue to the box and let it dry. This gives a slick-ish finish that the clay will hold onto. (Raw clay doesn’t stick to wood or paper very well.) Two, you can use the wet glue (or liquid clay) when you apply the clay. This makes it stay on with sort of a suction action, then during curing it sort of fuses. Superglues will tend to absorb into the wood and not be so good for sticking, by the way. I have been using loctite brush on superglue for a couple of years and it’s been great, my jewelry pieces are all in one piece, nothing has fallen off ever. As far back as I can remember customers have never complained about anything coming off. Just the other day my fourteen year old daughter was telling me that it’s incredible how well made the earrings were (two sets of earrings I made), she’s had them for 3 years uses them daily and still they look great and the backs are super tight. I got one of them and was inspecting the back of the earring the metal stud and tried moving it but I failed it is stuck on there very well. Maybe it’s luck I don’t know but this glue has worked for me. I used the loctite with the brush for years as well. I also like it. I think it’s similar to the gel. The key is to not use low-end cheapie superglues…they’re just soo brittle. This is all very new to me but I want to start working with polymer clay too and I have so many questions, but most importantly, there’s one that’s bugging me more than the rest: can metal insertions like 0.7mm wire stick to polymer clay if cured in the oven together? I read about the physical bonding method but I am still confused. What if my metal insertion is not fully integrated in the clay? Like, I don’t want to push the wire all the way through the clay to the outside, I just want to have one part of wire coming out of my clay, while the other end is hidden inside. Can that wire stick to the clay, or will it pop right off after it’s cured? Yes, you can stick a piece of metal wire into the clay and bake it. The only thing is, the wire will often pull right back out after baking. You can solve that problem by glueing the wire back in after baking. But a better solution is to make a bend or loop in the wire and then insert that into the clay. That way, after curing, the wire won’t come out. Thank you! I don’t know why I couldn’t think of that, but I guess it was because I was too afraid of a failed project. I am going to start working on my projects as soon as I can spare time! Thank you so much! I baked 3″ tall (and 1/2″ thick) clay figurines from Sculpy. Want to attach their flat backs to a flat wooden ornament that has been painted. 1) What glue to use? 2) Is there anything I can do now to make them less brittle when dropped? (A) Bake again? Will that make them crack? I originally baked each 20-22 min at 275–package directions said 15 min per 1/4″ and these are 1/8 in some parts and the thickest is almost 1/2. …and if I bake them again, is it ok that I’ve painted accents on them already? (B) Coat in laquer or polyeurethane? Will that change the color? Of course it’ll make them shinier. Yes, I would bake them again at 275°F, make sure you cover it with foil (a tent of foil is fine) and bake for 45 minutes (after the oven preheats). I can’t guarantee they’ll be super strong, but a full bake will certainly help. Having paint on them shouldn’t matter (though some paints DO change color with baking). As for glue, I would use a glue with substance, something with thickness, such as Liquid Fusion or Gorilla Glue (urethane glue). I would not use superglue as it’s brittle and too thin. You want a glue that will squish in there and hold. Wood glue might work, too, but you’re going to need a good 24-48 hours to dry no matter what glue you choose. I would not varnish them at all unless you have Varathane Crystal Clear on hand (it’s not typically sold locally). Varnishes over paint on polymer get sticky with remarkable frequency. Thank you SO much for the quick and thorough reply, Ginger. I appreciate it! I have made several little sheep with white Premo clay. I’ve used Aileene’s Turbo Tacky Glue to glue on small tiny flocking to my sheep. So far everything is okay. I read your article and no mention of using fibers or anything related to fabric. Do you think this will work in the long run? I have E6000 but did not want to use it because it is so messy, stinky and takes for ever to dry. Thank you for your time! I agree that using E6000 would not be a good strategy, and I agree that using Aleene’s Tacky Glue is a good idea. Generally fiber is best glued to polymer clay by using a white glue or white glue variant. You’re doing fine! Thank you again Ginger for this detailed information about glues that work with clay. As always you are doing an awesome job. Any idea if it works only on baked clay to stick to the metal, not raw clay? Hello clay masters..im molly from the philippines,,im kinda new in the world of polymer clay..eventhough clay,tools and everything needed to do polymer projects are hard to find in our country..i just love polymer clay..and for years ive been trying to make some projects with just a little knowledge about clay..all my tools before were things inside our house.and i remember when the first time,i badly wanted to buy polymer clay but i didnt know then that it was soooo expensive!..so i practiced on clay dough for children. =( (probably my saddesst day…kidding!).. i realized,i couldnt afford all the things needed to start claying,so i just gave up.but as years passed.i have noticed online that some people are already selling polymer clay,tools and everything ive been dreaming about polymer clay!!!! .so i started saving,this is it! After years of saving i finally started a small souvenir/giftshop online. (homebased) and when i started to get orders..and started marketing.i just cant believe problems with polymer clay are indeed endless but so fullfilling when you solve one.esp on your own.but i have this situation that i wanted to ask, how do i stick clay on mugs permanently? .i tried super glue but after putting hot coffee in the mug, the clay fell off.its so frustrating because ive been reading your messages and the glues and brands you mentioned are not available in here. I made a beautiful dragonfly on a mason jar. Baked it at suggested temp and time. All was well until a month later while pacaging for shipment my clay vines started falling off. I glued back on with E6000. What can I do in future so this doesn’t reaccure? I washed dried and then cleaned glass with alcohol before I applied clay. What did I do wrong? When applying polymer clay to a glass surface, you need to make sure the design wraps around the glass so that all areas of the clay attach to another piece of clay. That way the clay won’t fall off. There’s nothing you can do to prevent this. Even glue will not necessarily keep clay attached to glass over time. Stay tuned, I’ll be writing more about this in the future. Hi Paulette, it sounds like you’re not baking hot enough. Try raising your temperature and you should get better results. This is my first time using polymer clay, and this website has been such a big help. I was wondering, though, would it be possible to glue polymer clay pieces to a fake pumpkin? If so, how would I do it? Any help you can give me will be greatly appreciated! Thank you in advance. Sure, no problem. Just bake the clay first, then use glue to attach it to the pumpkin. I would use Weldbond white glue or possibly Gorilla Glue. You could also embed wire into your polymer clay before baking, then wire it to your pumpkin. You’d probably want to drill holes in the pumpkin for the wire. That would hold the best. Ginger, I’m working on polymer clay coasters and want to glue a cork square to the back of the coaster, what adhesive would you recommend for this? I’d use a urethane glue such as Gorilla Glue or Liquid Fusion. Or a strong PVA glue such as Weldbond. Or an epoxy glue…the type where you mix two parts together, such as J.B. Weld. I have so many questions. I’m making polymer clay snowman heads and carrot noses. Is the best way to bond the heads and noses together to bake them assembled? And am I to use glue then bake? Or will they bond together just by touching. The final step is to attach to the scoop part of a teaspoon. Should the head be placed on the teaspoon before baking? And which glue, if “yes”, should I use (before baking)? I’ve read through all this fantastic information but still not sure what glue to use. Would a different glue be used if attaching these pieces together after baking? Hi Carol, you can do it many ways. Raw to raw, then bake, no glue required. Or you can make them separately and glue them after baking. Or you can bake the noses, stick them into the raw heads, then bake. I would bake the noses first, then they’re easy to stick into the raw faces. Then bake again. You could add a tiny drop of liquid clay around the carrot before sticking it into the face. But I don’t think it would be necessary. Thanks. So gluing the head to the metal spoon. Recommended glue? Or would baking the head on the spoon with no glue adhere it to the spoon? Hi, are you aware of any 3M VHB double sided tapes that will bond cured plymer clay to painted (2 pak) metal surfaces? I’m sorry, I don’t. Polymer clay is a plasticized vinyl, however. Maybe that will help your search. I would ask some manufacturers of the tapes. Wondering how I would bond small disks of plain cured clay onto other slightly larger pieces of cured clay which have surface treatments on them, like crackle medium and pan pastels and maybe even an acrylic sealer? I would use a thick-ish glue such as a 2-part epoxy. Hello. I’m new! Tell me which glue is best for attaching wool to animals made from polymer clay? I would use a glue like Weldbond or another strong white glue. I’m making polymer clay brooches and lapel pins and was wondering what the best glue for this would be? The best one to secure metal brooch backs and metal pins I’m so confused thank you for your time!! This is addressed in the article when I talked about adding glue-on bails. The best way to attach brooch backs is to use a physical bond. In other words, bake some clay over the center bar. I over baked baked a polymer clay sculpture that now has many hairline cracks in it. It did not burn, but I want to seal it before I paint it, to ensure its strength. I cannot find the PC-7 epoxy in my area. I have Weldbond and Liquid Fusion, would either of those be better to use as a light seal coat over the piece to ensure the cracks get filled & sealed? Polymer clay does not need to be sealed. Just paint it. Also, the cracks are not due to overbaking. They’re due to the project being too thick and having too much thickness being baked at one time. (Next time, do it in layers or stages.) Sealers or varnishes won’t add strength. Is hot glue okay to use on baked clay? I been looking up steps for a future project I wanna do and an idea was presented by a friend of using piece-by-piece construction with baked clay and hot glue. Hot glue won’t harm polymer clay, but it won’t hold very long. It tends to peel off. What a helpful article. I do not work with clay, but with decoupaged (paper and glue over) aluminum which I fasten onto steel barrettes. For 3-4 years, E-6000 has worked for me with no failures, until this summer when the steel clasps are coming undone from the decoupaged aluminum. 3-4 years! How many customers I’ve sold these barrettes to and now the product fails? What a shame…. Heart-breaking – I am now experimenting with JB Weld. Enjoyed reading the JB Weld comments. I have watched some very good videos on You-Tube about adhesives and the best one says that the original JB Weld works best (shown in the video ). I also have thinned the product, after mixing, with a bit of acetone so I can use it in a syringe-applicator. Sadly, your experience is common. This is the exact reason that I don’t recommend using E6000. It works fabulously for the first few years, then suddenly…boom. Oh The Glue dilemma! I have read all the posts, And it appears most glues are hit and miss depending on application. So, I have a ton of Swarovski flat backs I want to use up, on polymer clay. ( I only use hotfix now) but these are not. If I bake the finished piece, and pop out the NON hotfix crystals, can I apply Sculpey Bake and Bond and if so, do I bake again, or air dry? Thanks in advance, I have learned so much from you and the forum contributors! Bake and Bond is essentially thick liquid clay, so it needs to be baked to cure. I’m making clay gingerbread men ornaments as my handmade Christmas gifts this year. I accidentally forgot to add the eyelet before baking and they are too thin to attempt to drill a hole as I need to mail them in a few days and can’t risk experimenting. I’m going with plan B and going to glue a satin type 1/4 inch ribbon to the back for hanging them. I really only have Aleene’s Turbo Tacky glue as an option and would love to know if you think this would work. Will this glue permanently hold the ribbon on? Thank you for such an informative article about the glues! No, I don’t think the glue will hold over time. If polymer clay is adequately baked, there’s no reason you can’t drill a hole. Even paper-thin polymer can be drilled (though that’s usually best punched). You can always add a patch of clay where you will drill (to reinforce the area) and bake again. I wanted to make a snowglobe using a jar with a metal lid. Do you have any suggestions on the best way to attach the polymer clay figurines to the metal lid? You’ll need a glue that won’t be softened by contact with water. I think that a clear silicone sealant would work well. Make sure you embed the polymer pieces into the silicone a little bit so it comes up and over the “feet” of the polymer items. If that makes sense. Hi! I realize this is an old post, but I recently corresponded with the Gorilla company. They suggested their Gorilla Clear Grip (polymer to metal). Though they confessed they did not actually test it. The plus side of it is that it’s repositionable for a short time, unlike the “super” gels. Have you ever tried it? Thanks for the so very informative site! No, I haven’t tried it. But perhaps I need to. Thanks for the info! I make hair bows and I want to add polymer clay sprinkles to them. I’ve seen what looks like icing on hair bows with the clay sprinkles on it. Does anyone know what that white adhesive is that’s looks like icing? Usually, that white drippy stuff is white polymer clay mixed with enough liquid clay to make it runny.